At Carolina Retreats, we believe a vacation should be more than just a place to stay and technology cannot replace people when it comes to hospitality. Ever since our founding, Carolina Retreats and our affiliate brands have earned an impeccable reputation on an unwavering commitment to our clients, guests, employees and the communities we serve. Our singular focus has been on creating unforgettable, authentic experiences for our valued guests, and protecting our client's hard-earned assets while maximizing their income and occupancy potential. We exist because of our homeowners, guests and team members. Just because that is how things have always been done, doesn't mean it's right. Focus on doing the right things, for the people we serve, no matter what. Do what others won't today, so you can do what others can't tomorrow. With our "Technology plus People" philosophy, we offer a turnkey, end to end vacation rental and hospitality management solution that gives you peace of mind knowing that your property is being cared for and marketed by local professionals. We pride ourselves on our long-term approach to client relationships and shared values. Blue Water Realty is now Blue Water Realty by Carolina Retreats. Same great service and exceptional rates with a brand new website! 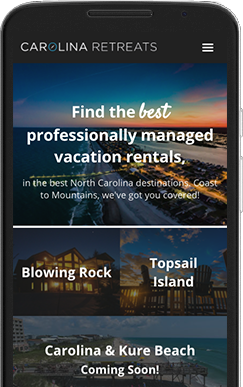 Discover all of your favorite North Carolina vacation rentals at CarolinaRetreats.com.